The current Reichstag dome is a glass dome constructed on top of the rebuilt Reichstag building in Berlin. It was designed by architect Norman Foster and built to symbolize the reunification of Germany. The distinctive appearance of the dome has made it a prominent landmark in Berlin. 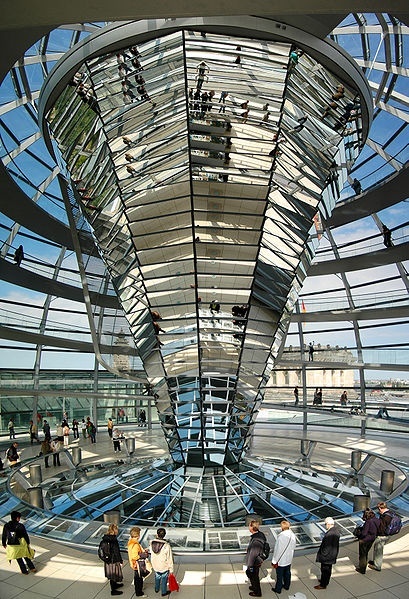 The Reichstag dome is a large glass dome with a 360 degree view of the surrounding Berlin cityscape. The debating chamber of the Bundestag, the German parliament, can be seen down below. A mirrored cone in the center of the dome directs sunlight into the building, and so that visitors can see the working of the chamber. The dome is open to the public and can be reached by climbing two steel, spiraling ramps that are reminiscent of a double-helix. The Dome symbolizes that the people are above the government, as was not the case during National Socialism.